Your skin is the largest organ in your body and is the first barrier to protecting yourself from damaging radicals. Chlorophyll is a natural, fat-soluble molecule found in plants that gives plant their green color. 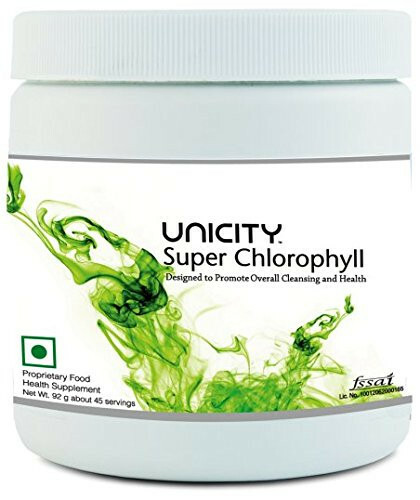 Chlorophyllin, the form of chlorophyll used in UNICITY SUPER CHLOROPHYLL is a water soluble version of chlorophyll that contains copper instead of magnesium as its central atom. Plants use chlorophyll to trap light needed for photosynthesis, the process which creates the energy needed to separate water to make sugar and oxygen. A key ingredient in Super Chlorophyll is chlorophyll from the Alfalfa plant. Alfalfa has been used for centuries by various cultures as a vitalizing and cleansing agent, and science has recently confirmed the potential health benefits of chlorophyll as supplementation. Your skin is the largest organ in your body and is the first barrier to protecting yourself from damaging freeradicals. The freeradicals speed up the aging process and harm healthy cells, making skin appear wrinkled, dry, and discolored. For decades, many cultures have used chlorophyll to heal and revitalize damaged skin. Scientists proved that chlorophyll kills harmful bacteria. It fights infections, bad odors in the mouth, gum disease, and destroys putrefactive bacteria in the digestive tract. It promotes healing of wounds by stimulating the production of connective tissue, and the list goes on. Studies have revealed that Chlorophyllin in Super Chlorophyll—acts as pH balance Detoxifier Anti-microbial Helps in faster wound healing and as body antioxidant.